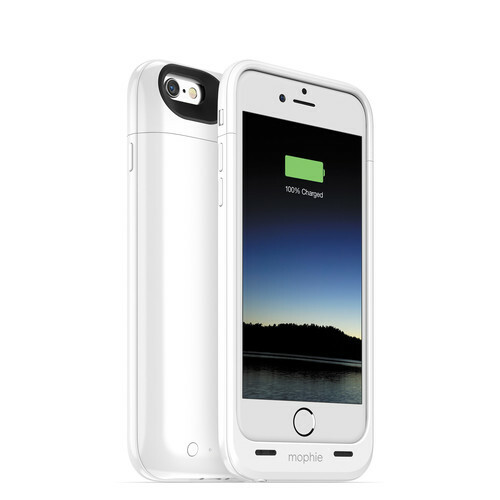 Keep your iPhone 6/6s protected and charged with the mophie juice pack air Battery Case in white. This case features a built-in battery and protects your device's back panel and sides. The lithium-polymer battery extends your device's battery life by more than 100%, so you can stay connected for longer. Internal rubber bumpers absorb shock, and a raised front bezel lifts your screen away from dirt and dust when placed face down. The juice pack has LED indicators on the outside so you always know how much power it has left, and an on/off switch gives you control over when the case's battery kicks in. It also features digital power management and pass-through charging and syncing, so you can safely charge your phone's internal battery and transfer data via the included micro-USB cable without removing your juice pack. The 2750mAh lithium-polymer battery in the juice pack air provides up to by more than 100%% additional power for your device. Please note that additional power is approximate and can vary based upon battery age, temperature, charging methods, and other factors. Enables pass-through charge and sync while connected to a computer. Your device recharges first, and then the juice pack case recharges itself. An integrated standby switch allows you to choose when to charge or save some juice for when you need it most. The LED power indicator displays the juice pack battery levels and charge status. Smart charging circuitry provides your device with an optimal amount of power for a safe, quick charge. Box Dimensions (LxWxH) 7.008 x 4.252 x 1.102"
juice pack air for iPhone 6/6s (White) is rated 5.0 out of 5 by 4. Rated 5 out of 5 by Mark from Worth the Investment I bought this for my new iPhone 6S and was not disappointed. I have owned several older models. The design is sleek and streamlined. The Mophie doubles the battery life as advertised. Good purchase. Rated 5 out of 5 by STM from Works smoothly It is a good looking cover and offer a decent extension of battery power. Is this case available for iPhone 6plus? I am sorry, we do not have this model case available for the 6 plus. Does the fingerprint scan still work with this case? Yes, the fingerprint scanner is not covered up. So it should work just fine. Can be this case charge wireless? No, the Mophie Juice Pack Air for iPhone 6/6s requires charging by either being connected to a computer or other power source.